Howlin' Wolf Records: SIX STRINGS: Give a Little... Get Something Back! Benefiting Victims Of Typhoon Yolanda In The Philippines “Lead Me Home” First Single From The Forthcoming Original Cast Recording, Heartbeat of Home, A New Music And Dance Spectacular With Music By Brian Byrne, To Be Released February 2014 On Decca/Universal Music Classics November 22, 2013 (New York, NY) – American Idol star Jessica Sanchez lends her soaring vocals to the inspiring single, “Lead Me Home,” the first track available from the forthcoming Original Cast Recording, Heartbeat of Home. The full length album will be released on Decca/Universal Music Classics in February 2014. “Lead Me Home” will be made available Friday, November 22nd at iTunes and all digital retail partners (CLICK HERE!!). 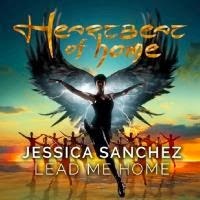 As a young singer of Philippine decent, Sanchez and the Decca label have partnered to donate $0.90 from each single sold of “Lead Me Home” to the Red Cross to support those affected by Typhoon Yolanda in the region. On the heels of the new single, Sanchez is also scheduled to sing both the Philippine National Anthem and the U.S. National Anthem on November 24th when eight-division title holder Manny Pacquiao returns to the ring to battle Brandon Rios in Macao (Pacquiao is dedicating this fight for all the victims of typhoon Yolanda). As part of her ongoing charitable work, Sanchez will also visit the Philippines in December on a mission with the Starkey Hearing Foundation to assist residents with hearing loss who have no resources to acquire hearing aids. Hearbeat of Home, the new music and dance spectacular from the producers of Riverdance, lovingly encompasses a diverse array of multi-cultural influences, blending the thunder and drama of Irish dance with the sultriness and attitude of Latin American salsa, and the glorious rhythms of Africa. Three years in the making, Hearbeat of Home features original music by Golden Globe-nominated composer Brian Byrne and lyrics by award-winning writer Joseph O’Connor, and will be featured on PBS stations across the country in the month of March (check local listings). A documentary on the making of the show will also air on select PBS stations this December. In early 2014, the stage show will also make its North American debut at Toronto’s Ed Mirvish Theatre January 21st through March 2nd, with a series of shows to follow at Chicago’s Oriental Theatre March 4th through 16th, Detroit’s Fisher Theatre March 18th through 23rd and Boston’s Wang Theatre March 25th through April 6th. More U.S. live dates will be announced soon.